In 2019, we are excited to offer not one but two adventures to the fascinating country of South Africa. But how do you choose? Are you a nature and wine lover that jumps at the chance to combine hiking and wine tasting – especially since most wine regions are set in stunning locations? Yes? 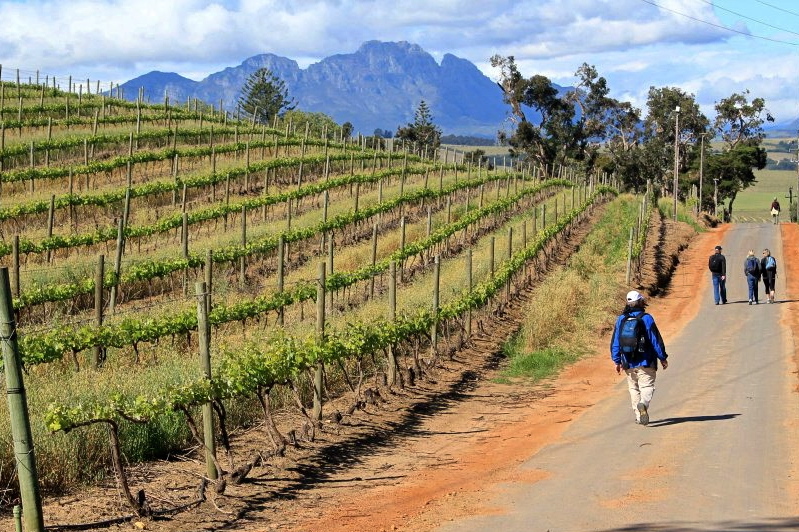 Then join us on our South Africa: Hiking, Wine, & Safari Adventure, we’ll visit the well-known Stellenbosch wine region where the views and wine won’t disappoint. We’ll make sure to stop and taste wine from some of South Africa’s best wineries. Additionally, we’ll take in the stunning and unique scenery of the Cape Floral Kingdom while hiking along coastal trails and through vineyards and villages, hike up the magnificent Table Mountain in Cape Town, and observe penguins, ostriches, baboons and more on the Cape of Good Hope. To cap things off, we end our adventure with a safari near Kruger National Park where we’ll be on the lookout for the big five – lions, leopards, elephants, rhinos and cheetahs! Is wildlife conservation a cause that is near and dear to your heart? Do you get excited by the opportunity to not only to see a number of magnificent creatures up close but to be able to volunteer your time and energy to help them thrive? Yes? Then join us on the South Africa: Wildlife Conservation Volunteer Adventure, where we shift our focus from sightseeing to volunteering. Zephyr has partnered with a wildlife conservation non-profit organization to set up a week-long hands-on volunteer opportunity. We’ll have the privilege of lending a hand with the Siyafunda Endangered Species Project in the Makalali Game Reserve. During our time at camp, we will be participating in a number of conservation efforts such as animal tracking, game census, bird identification, and plant and tree identification. We’ll take walks through the bush, go on game drives to find “the big five”, and generally help out around camp. Whichever adventure you choose whether it’s the South Africa: Hiking, Wine, & Safari Adventure or the South Africa: Wildlife Conservation Volunteer Adventure, we welcome you to join us on a vacation that you won’t soon forget!